is a prestigious competition for vocalists, strings, winds/brass, and chamber music at the Branch and State levels. In 1971, cellist Gretchen Kuehny Geber and pianist Eleonor Dalton of MTAC’s San Fernando West Valley Branch created VOCE as a means of providing solo and chamber ensemble opportunities for students. The group was named for Vocalists, Orchestral instrumentalists, Chamber music, and Ensembles. 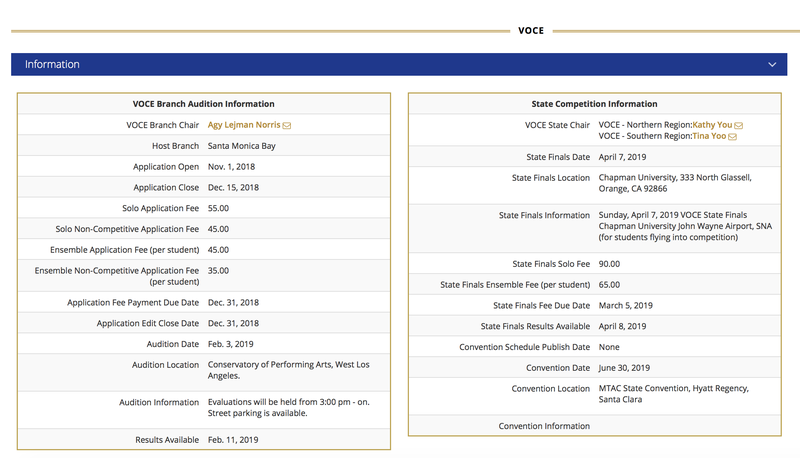 The first State VOCE Recital was held July 7, 1972 at the MTAC Convention in North Hollywood. Since then, the program has grown from five winning categories to ten. In 1998, 244 students performed, resulting in 46 competing finalists. In 2004, that number grew to 100 finalists.